Wá is woah – amazing. Whether you get the omakase chef’s menu or order á la carte, you will be mesmerised by the quality of ingredients and the skills of the chef. 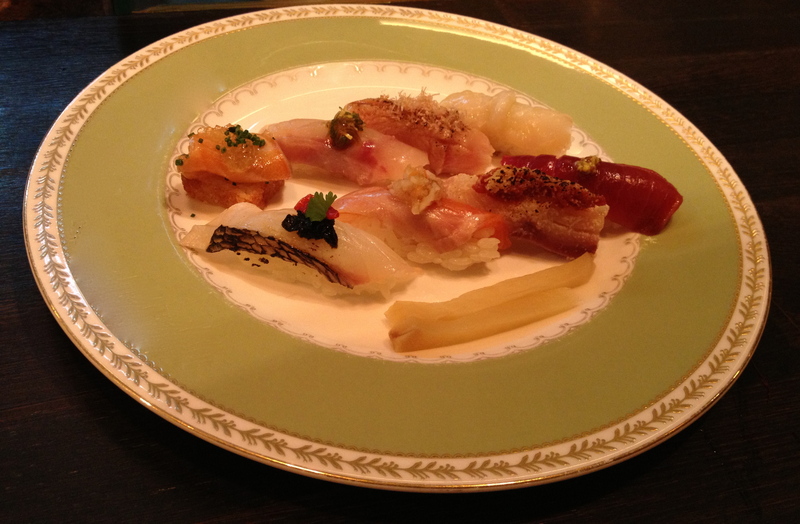 Cuisine: Japanese, sushi and innovative Japanese cold and warm dishes. Price: Medium (for such a tremendous quality it is a good deal, compared to the hyped Matsuhisa south on the same road or the ultra-luxurious Urasawa on Rodeo it is a steal). Chef: The trio of founding chefs from Japan come from the rare breed of chefs honing their culinary skills at the nearby Matsuhisa. As many from this herd of skilled chefs they left this legendary precursor to the international chain of trendy Japanese restaurants Nobu (Matsuhisa) and established their own place. Wá has been at La Cienega for some years now and it has under its roof multiple dining awards mainly from the critical local press, but also from the coveted Zagat guide that gave Wá extraordinary 28 points (30 is maximum). Food: Traditional with gourmet twist of the chef and superb quality of ingredients. The menu is fun as most of it are dishes you have probably never seen before. If you do not want to risk it order one of the most popular dishes highlighted on the first page. 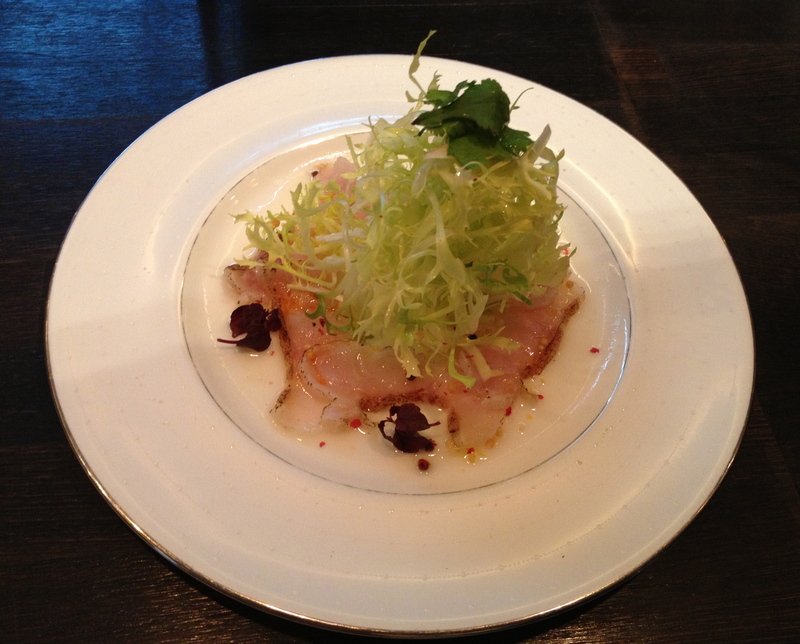 I have started with the Halibut Carpaccio and savoured the Tuna Carpaccio from the omakase of my partner and was not disappointed. The fish was fresh and the condiments (mustard sauce) perfectly matched the type of the fish. My next course was more adventurous. I have ordered the Mozuku kelp that the server told me is popular in Japan (mainly in Okinawa) but not in the US for its rather “very traditional taste”. Usually majority of diners go for the dark green wakame sea weed, the flat wide noodle-shaped and slightly crunchy seaweed that is tasty only with vinegar and other condiments, yet I was pleasantly surprised by the Mozuku sea weed. Resembling super-thin soba noodles, it was slightly brownish and delicate. 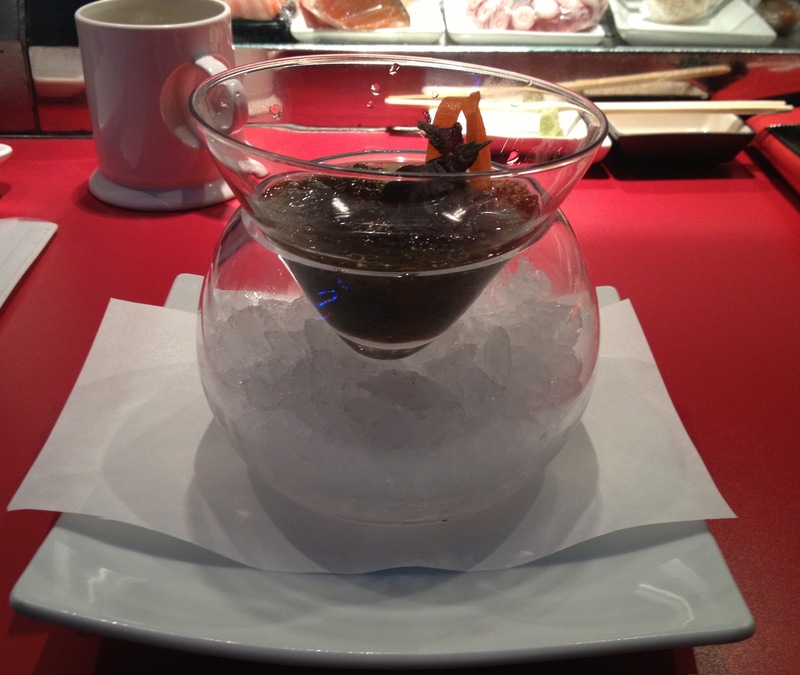 The chef made it savoury with sweet soy vinegar and served on a bad of jelly in a flattering glass. 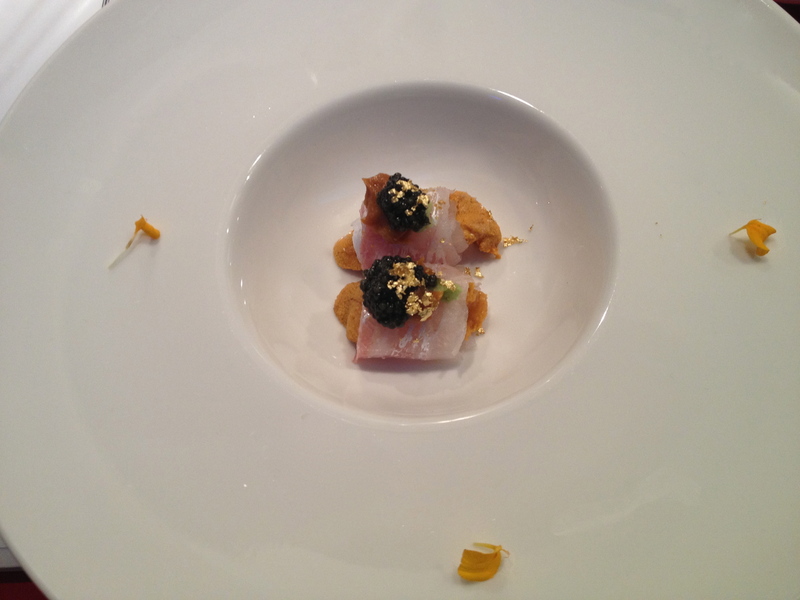 The omakase plate of Caviar and white fish uni was also quite adventurous yet delicious. This time I skipped the Caviar and gold leaf crowned terrine of ankimo (monkfish liver) since I was not as keen on it last time I had it at Matsuhisa in Aspen, Colorado. It seems quite rich and fatty next to the pristine fish and seafood dishes. 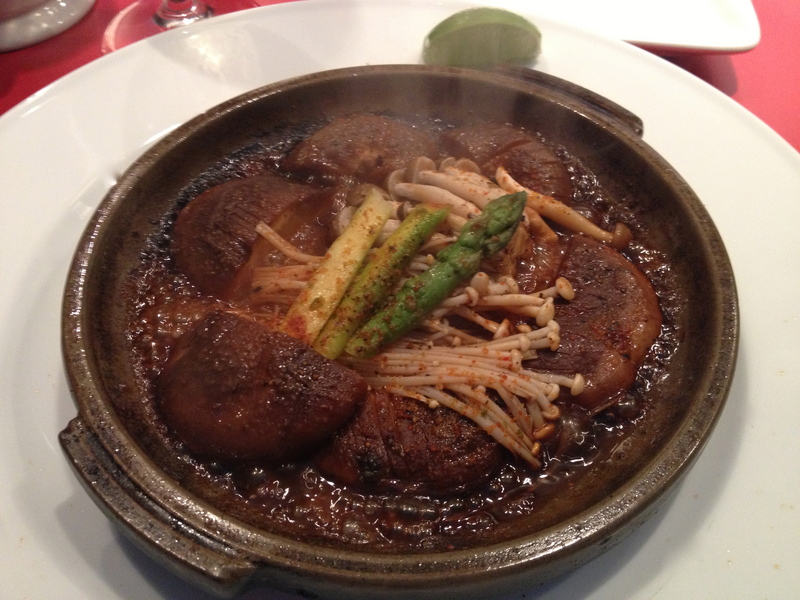 Vegetarian options such as the sizling Mushroom tobanyaki or tofu will please the local veggie fans. It is all well-presented so not only your soul but also your aesthetical self will both be pleased. 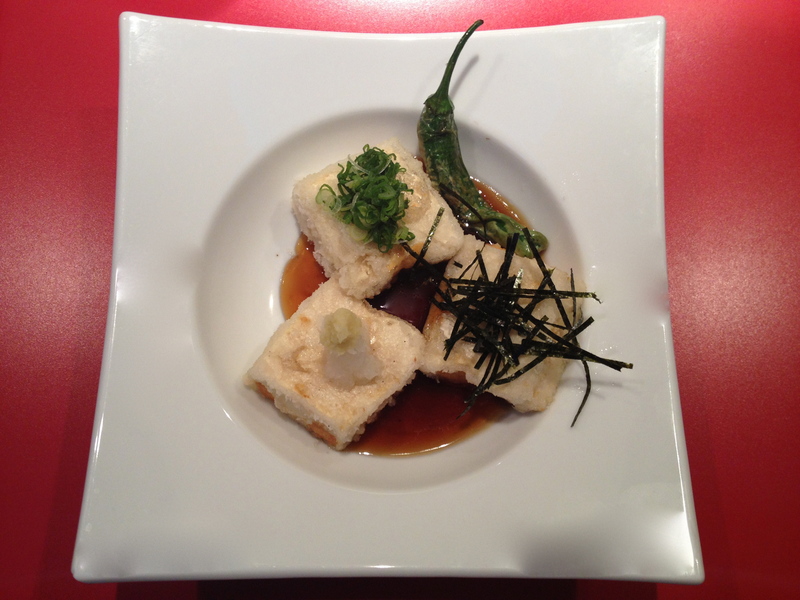 From the warm dishes I highly recommend the Agedashi tofu with pepper. The three cubes of lightly fried tofu in broth with shi-shito pepper, seaweed and condiments were soft with the sauce adding lots of freshness and depth to the neutral tofu. One of the signature dishes the Lobster Tempura with Spicy Creamy Sauce was delicious as well. It was not as big as the dishes like this (Rock shrimp tempura) tend to be, which is highly practical because the fried lobster together with spicy creamy sauce are quite hard to digest. Therefore enjoy this yummy dish with moderation in a stylish martini glass. Of course there are staples such as the The crispy rice and spicy tuna, but also the chef’s own take on them like in the Spicy Tuna Special of spicy tuna in shiso leaves, which is lightly fried with tempura sauce.. In the case of the crispy rice he fries it a bit more so the rice gets burning amber hues adding more richness and depth to the already distinctive tasting dish. There are some desserts on the menu as well. 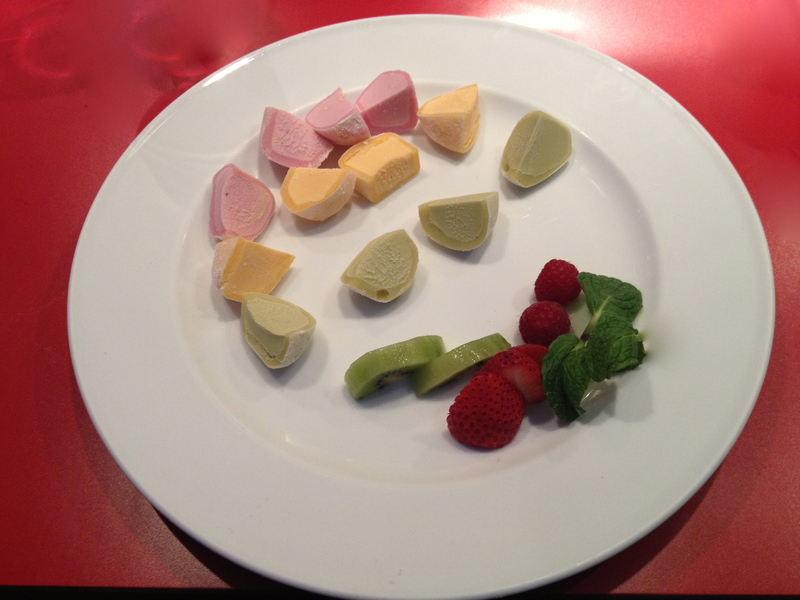 In Japanese restaurants I love the Mochi ice cream so I went for it. Just ask your server for available flavours. I got mango, green tea and vanilla – all subtle and slightly sweet, mango being my favourite. Usually I like the green tea flavour, yet this time the mochi was less about the tea and more about the sweetness presumingly catering to the local American palates. Atmosphere: Understated, friendly and humming with coming and leaving diners popping in and out constantly. Wá is not about looks, it is a low-key dining spot on the second floor of a small strip mall above a Jiu Jitsu school and just next to 7-Eleven market. There is a parking garage downstairs for the driving guests convenience. 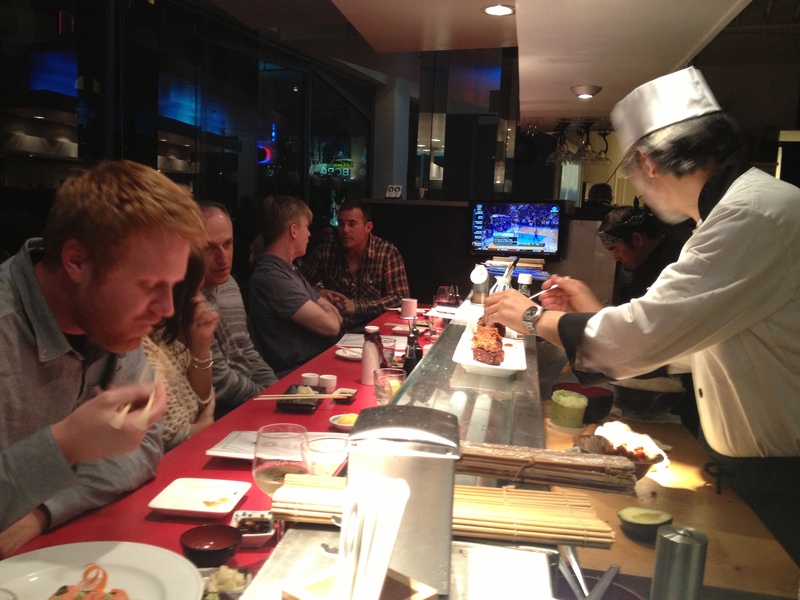 The sushi bistro additionally offers one semi-private room with a large Tv. There you can watch your favourite team or a Tv show with your friends while savouring the tremendous food. In the main dining room you can sit on a bar, which is ideal for the omakase, where the chef serves you one course after another as he pleases. The rest are just simple tables. Wear anything casual, even sneakers and baseball hats. I love the little details (like the one below) you can find around the restaurant. Opening hours: Open only for dinner Tue-Sun: 6pm-11pm. Closed on Mondays. 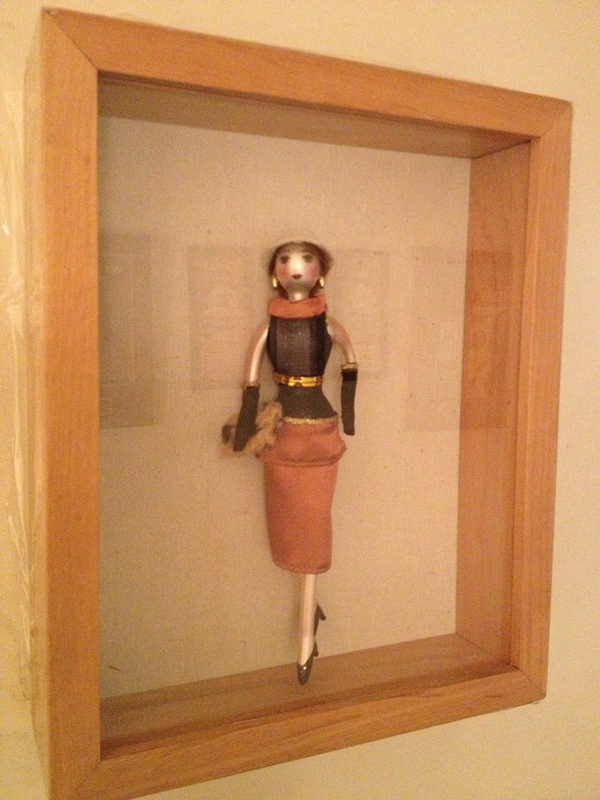 Address: 1106 N La Cienega Blvd #201; West Hollywood, CA 90069‎, USA. Price: Very expensive (Top CEOs, fashion models and Tv stars come to dine here in a secure and an almost invisible location). Atmosphere: The entrance to the restaurant is very discreet and guarded by security men. One would never think that there is a restaurant behind the simply looking wall along the Rua Lisboa. As the security opens the door and you walk through a tiny garden into the first room, you know that Jun Sakamoto is not just a traditionally simple Japanese restaurant (the interior was designed by the chef after whom the restaurant was named). It is full of classy people some conservatively dressed in ties and business suites others – especially the supermodel looking youthful women – in chic evening mini-dresses or anything that is currently fashionable. If you want even more privacy then dine in the back room. 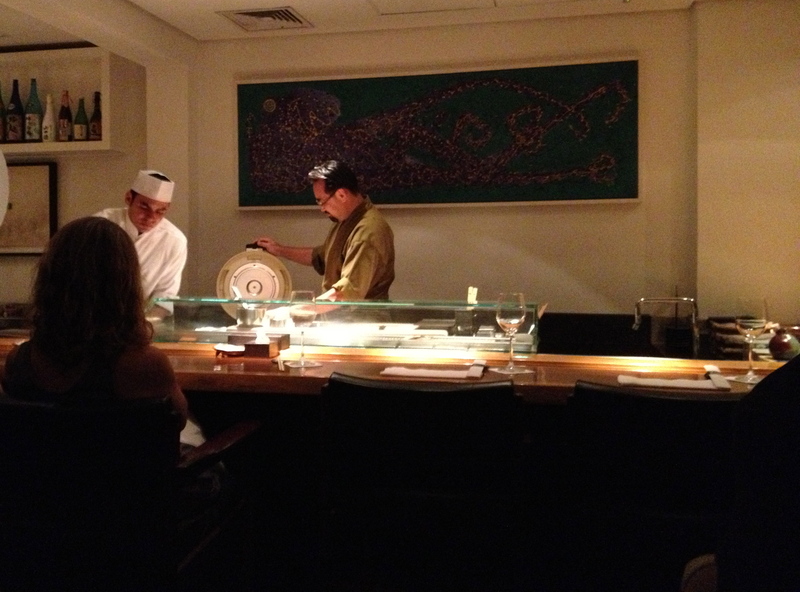 Both rooms together including a sushi bar accommodate not more than 30-40 people, so it is quite small. You still will be seen by the top players on the São Paulo rich and powerful league so better dress up for that as good as you can. 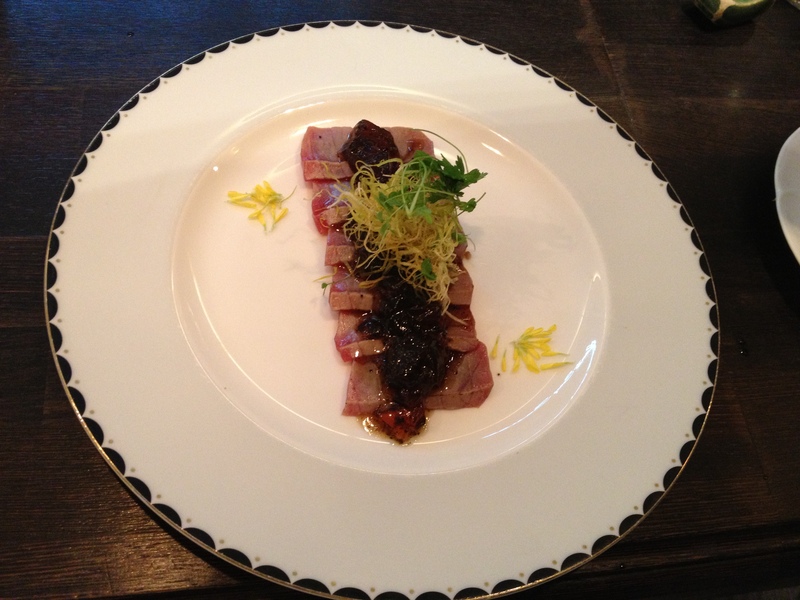 Food: For how much exclusive this restaurant tries to be, the food is not even slightly comparable to any of my favorite japanese places in LA, New York, Seattle or Paris. Rumors circulate in and out of the city that there is not much of excellent japanese food in Brazil yet. I take it as an explanation of my recent disappointment at Jun Sakamoto. For the restaurant being very expensive, I will not give it likely a second chance when there are so many other great restaurants to dine at in São Paulo. 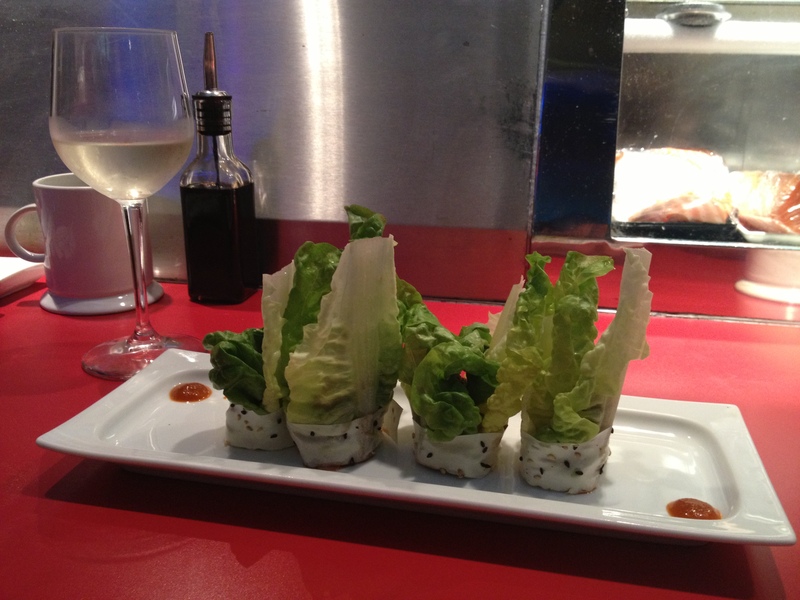 We got a number of starters to share and none of them had particularly impressed our taste buds. The Salmon tartare (Tuna tartare with foie gras is more popular here, but we were in the mood for salmon) was tiny, the fish was good but excellent as you would expect for the price and the sporadic portion of fish eggs on the top of it was not enough to bring more complex flavors to the dish. Continuing with a plate of fatty tuna sashimi, which was contrary to the previous too large portion of just a raw and not very tasty fish we started to worry a bit about the restaurant’s flattering reputation. The savior came in the form of the next order – the Asparagus salad, which was better and perhaps the only plate we quite enjoyed. The vegetables were fresh and crisp and the sauce was tasty. 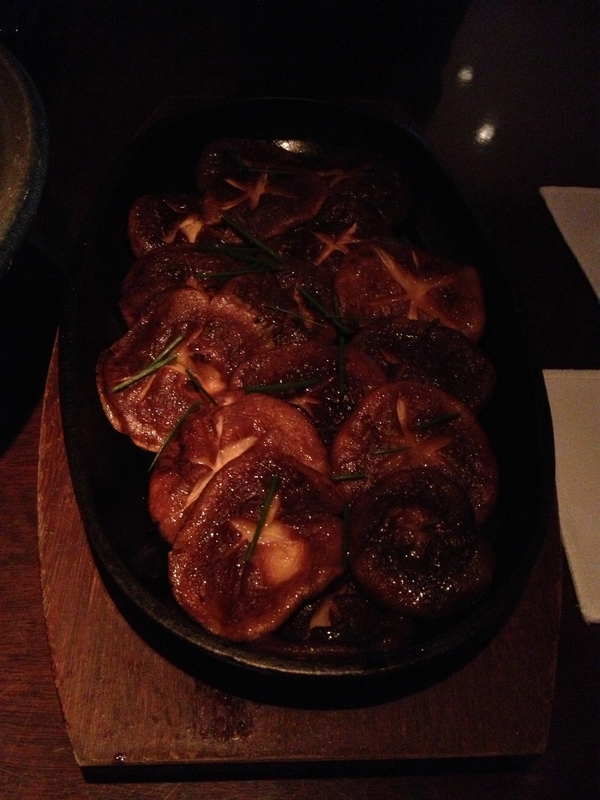 From the warm dishes the Seared mushrooms lacked everything that was savor-appealing. I dare to claim that they were boring. 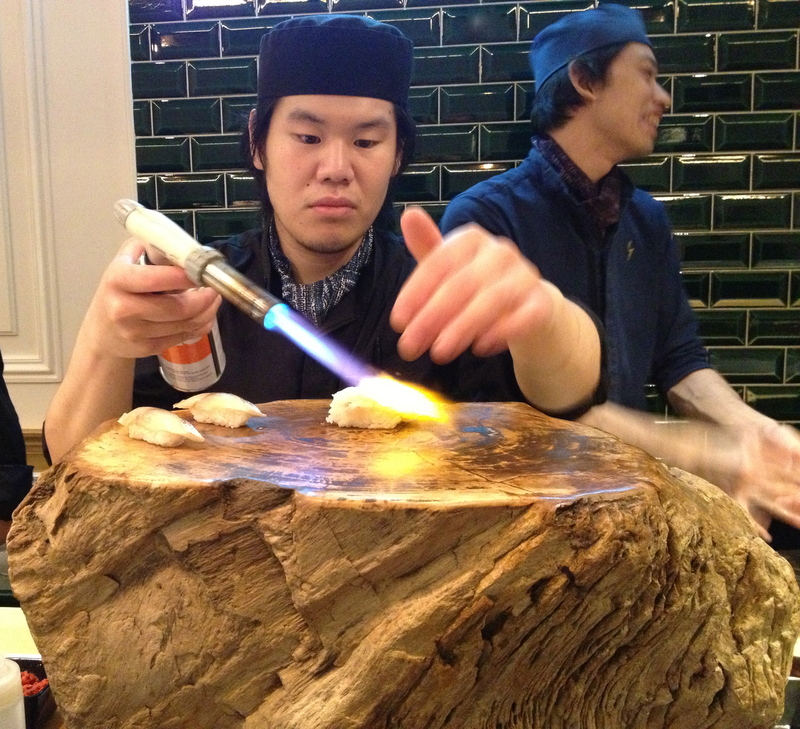 Right the opposite of the vibrant and sizzling Mushroom Tobanyaki they do at Nobu restaurants elsewhere. 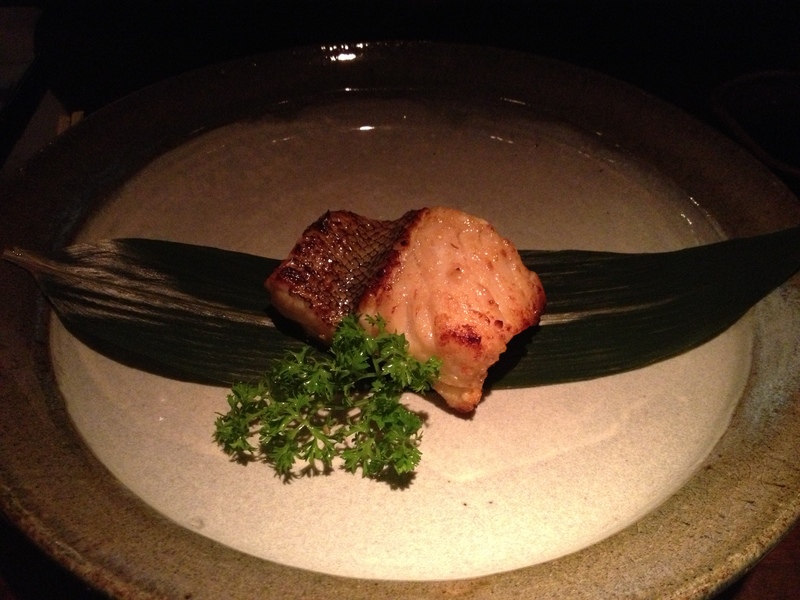 The staple of many Japanese restaurants globally is the Black cod with miso. 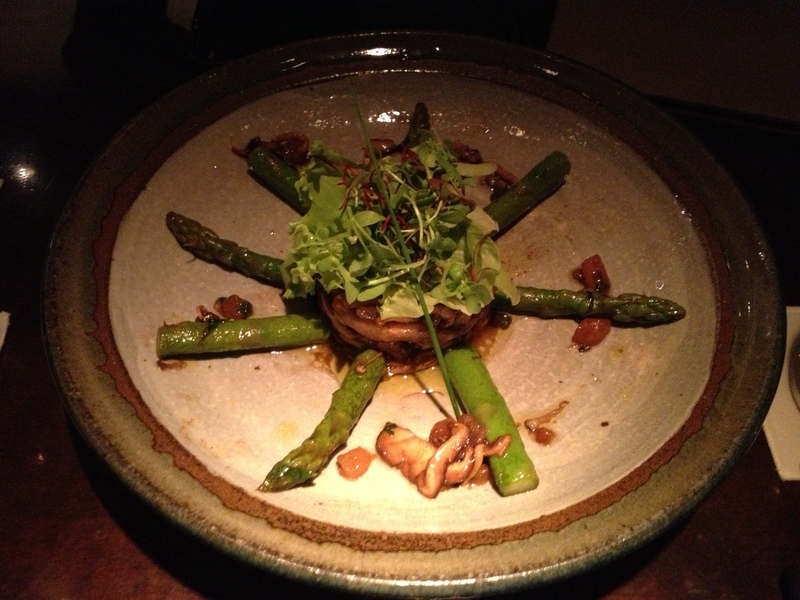 After the previous unsuccessful courses we ordered exactly this dish as we thought it might be more reliable. The fish was of a good quality, the sauce though was not intense enough and much more plain than we are used to. My partner tried the omakase sushi (ingredients selected by the chef who serves you to the point of your fullness, it shows the chef’s skills the best). They do it differently here though. You have to select how many courses you want and that is what you get. 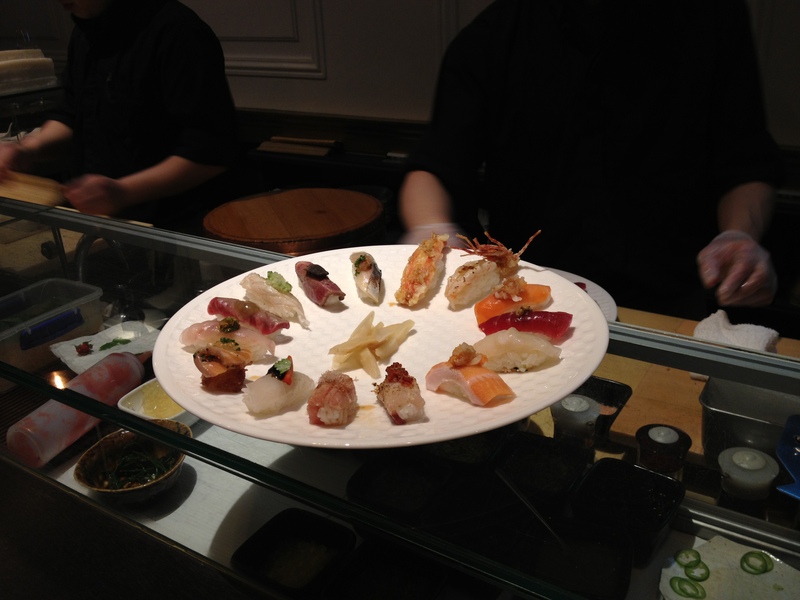 Omakase is supposed to display the chef’s innovativeness, creativity and the quality of his ingredients. 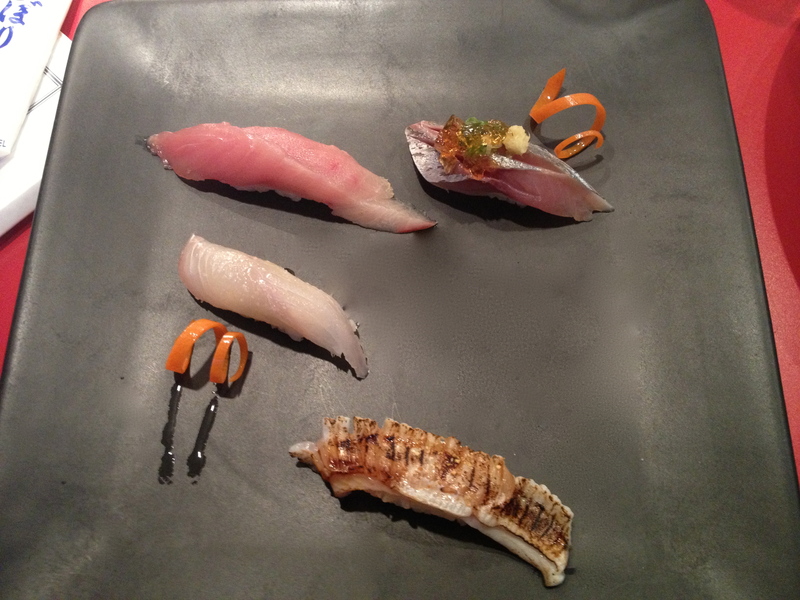 The sushi we got did not look and taste exceptionally – it was rather normal, but with a high price tag. Drinks: Sake and wine lists are good, although not particularly wide. You can find some less usual treats on the wine list though. We went for the Chilean Amayna Barrel Fermented Sauvignon Blanc 2007. Seeing a barrel fermented version of Sauvignon Blanc is quite rare. This refreshing grape varietal made famous by the Loire Valley in France as well as New Zealand is often let to express its freshness and zest. It was one of these quirks that one tries just for the sake of its differentiating quality. Wine Spectator gave it 91 points (out of 100) to this Leyda Valley warrior. I would not go as high since the barrel overwhelmed the fruit and its acidity in a greater proportion then it should have. The new oak left some nutty and vanilla aromas in the wine while the fruit turned into something like a fig marmelade than a refreshing white peach or grass that you can typically taste in wines made from this grape varietal. The depth though complement the raw fish quite well. 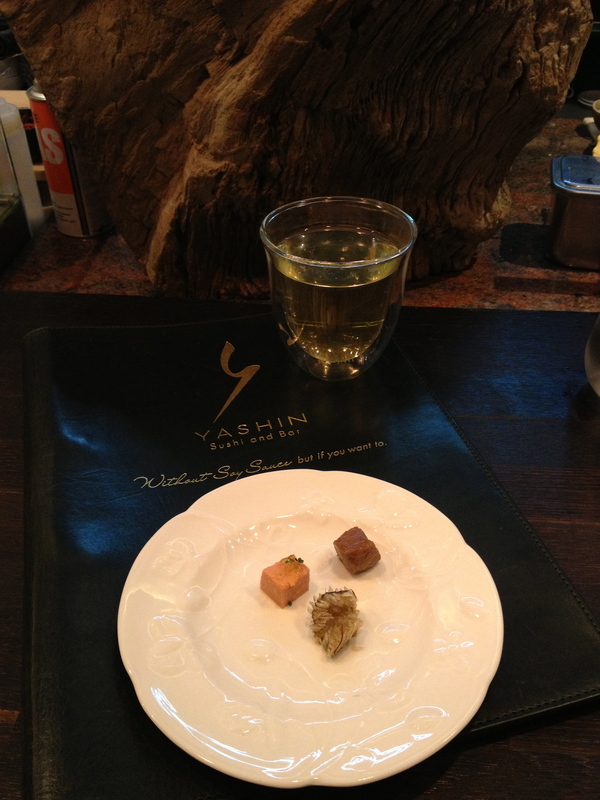 With japanese food I would rather go for an oaky Chardonnay or a Gewurtztraminer from Alsace. Opening hours: Only for dinner: Mon-Thu: 7pm-12.30am; Fri & Sat: 7pm-1am; Closed on Sunday. Address: Rua Lisboa 55, Jardim Paulista, São Paulo, Brazil.